Wall Cladding Systems consist of large flat sheets of hygienic plastic. Each sheet is joined to the next by an ‘H’ shaped joining strip, while ‘J’ shaped edge pieces run along the top and bottom of the sheets. These ‘joints’ and ‘edges’ are screwed to the wall through their wider back sections, so that every sheet is secured on all four edges. The sheets themselves hide all the fixings that are holding them there. Internal and External Angles are fitted in and around the room to make a perfect installation. 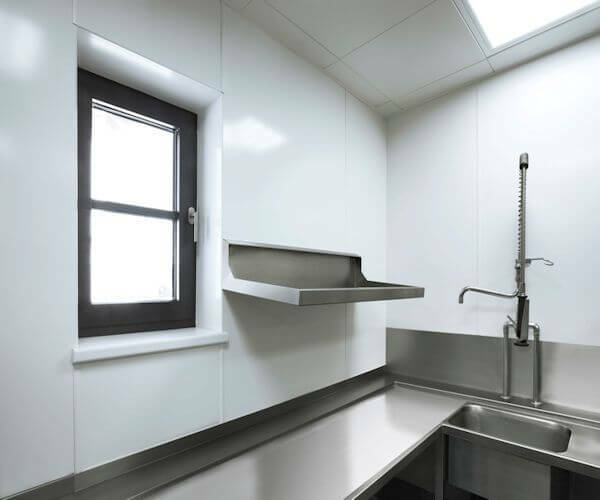 Wall cladding creates an ideal working environment for your commercial kitchen and helps keep it hygenically clean, is food safety compliant and fire resistant. Do you need a wall cladding system installed?